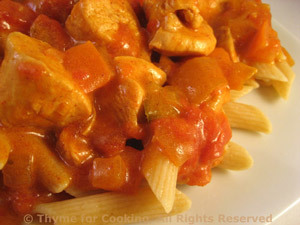 Chicken Paprikas on Pasta, Thyme for Cooking healthy gourmet main course. 1 1/4 cups (4.1oz, 125gr) pasta - farfalle, rigatoni, penne - or, to be more traditional, egg noodles. Cook pasta or noodles according to package directions. Open and drain tomatoes, reserving sauce for another use. Roughly chop pepper, onion and tomatoes. Cut the chicken breasts into 1 inch (2.5 cm) squares. In medium saucepan heat the oil over medium heat. Add the paprika, chili powder, and sauté for 1 - 2 minutes. Add the pepper, onion and garlic and sauté for 5 minutes. Add the chicken and sauté for 5 minutes. Add the stock and tomatoes, reduce heat to low and simmer for 15 minutes.